Warning: This article contains images and descriptions of extreme violence. Human Rights Watch released a report last week detailing — with horrific precision — a single massacre carried out by ISIS in which over 600 people are thought to have been executed. Witnesses say an ISIS militant filmed the atrocity. 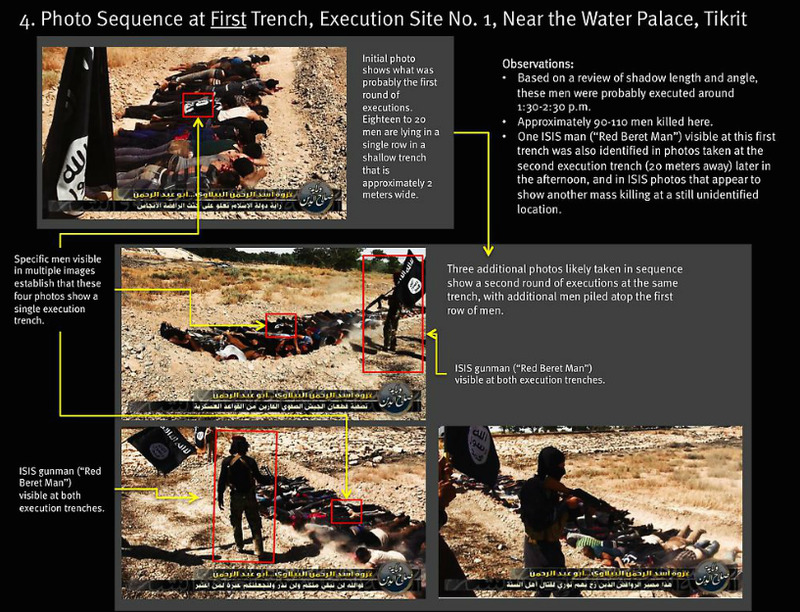 While Human Rights Watch says no footage of that massacre has been released, ISIS (also known as IS, ISIL, and Daesh) has bragged about previous atrocities, releasing nauseating videos of mass executions. 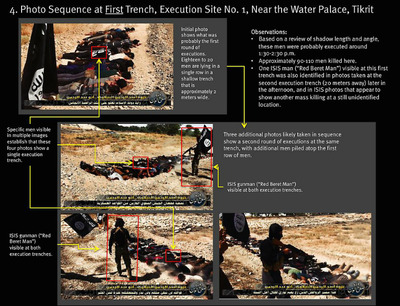 In explicit detail, one video released by the group, and seen by Business Insider, appears to shows the executions of at least 160 men and boys. Militants posted images in June claiming the victims were Iraqi soldiers, though most appear to be young men and boys be in civilian clothing. ISIS claimed to have killed 1,700 Iraqi prisoners of war, though human rights groups say the figure should be treated with some scepticism. 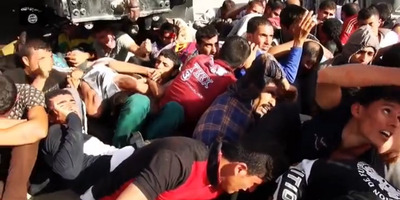 A subsequent investigation by Human Rights Watch, including interviews with witnesses and analysis of the footage, has revealed that between 560 and 770 people were killed in the massacres, which occurred in the Iraqi city of Tikrit. The footage shows the victims crammed into trucks for transport and bound and blindfolded lying face-down. In severe distress, some of the men plead with their captors, while others appear despondent. In one mass execution, at least 30 men are forced to march at gunpoint to a shallow pit in a desert landscape. They are then made to lie face down, with their hands behind their head. A man with an automatic weapon held casually in one hand then walks down the row of prisoners, firing bullets into each person one-by-one. The victims’ bodies spasm with each shot; several are seen writhing after their injuries. The shooter, accompanied my a fellow militant holding an ISIS flag, then takes a second pass, firing more bullets into the prisoners. In the image below, Human Rights Watch says it appears the mounds of dirt to the right are covering a mass grave of previously executed prisoners. A partially buried body appears to be visible in the lower right of the image. In another excution depicted in the video, three men are forced to kneel with their backs to a gunman on a large slab of concrete. Scores of other bodies are visible in the background. The kneeling men have their hands tied and their faces blindfolded. Each is shot in the head by a masked man with an automatic weapon. In the final section of footage, at least 15 men are forced to march in single file with their heads down and their hands on each other’s waists. One man appears to argue with a gunman, who then fires a shot above his head, prompting the captive to fall back into line. The men are brought down to a riverside. One by one, an ISIS militant brings each of the men to a concrete slab by the water’s edge, its surface slick with bright-red blood. A man with a handgun quickly fires a shot into each victim’s head. Those who don’t fall directly into the water are kicked in by the militants. To the side of the gunman stands another militant holding the ISIS flag. Some of the ISIS militants wear camouflage while others are dressed casually. Many are masked, though others are appear easily identifiable. 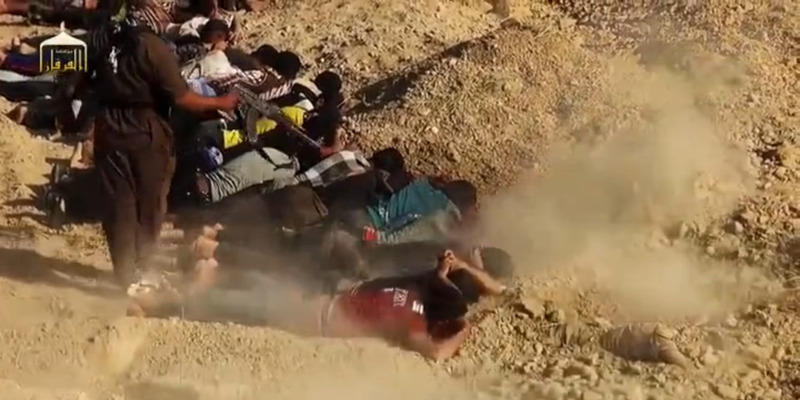 In the footage, which ISIS shot and edited, reverent music plays in the background. 560 and 770 men were executed in at least two locations between June 11 and 14. “The number of victims may well be much higher, but the difficulty of locating bodies and accessing the area has prevented a full investigation,” Human Rights Watch said. 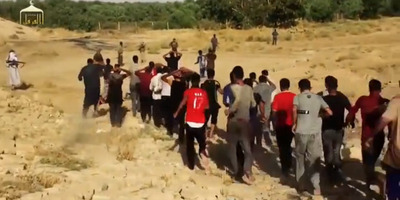 In theearlier June 10 massacredetailed by Human Rights Watch, 600 men were lined up, executed, and then burnt in the middle of the desert.Nine survivorsgave the organisation raw accounts of the violence. “They set my right leg on fire. But I had to withstand the pain so they wouldn’t know that I was still breathing. When they saw that I didn’t move, they told each other that I was dead. Then they burned the person next to me,” one survivor said. ISIS seized control of Mosul, Iraq’s second-largest city, on June 10. The organisation’s extreme brutality, demonsrated through atrocities like the massacres in the days after the city’s capture, created an atmoshpere of terror and panic that’s allowed ISIS to retain control of much of western Iraq. The coalition air campaign against the group continues amid frequent reports of the ISIS’s disregard for human rights: HRW has also reported that ISIS is enslaving and forcibly converting members of Iraq’s Yazidid religious minority, while targeting Shi’ite Muslim civilians and their places of worship.